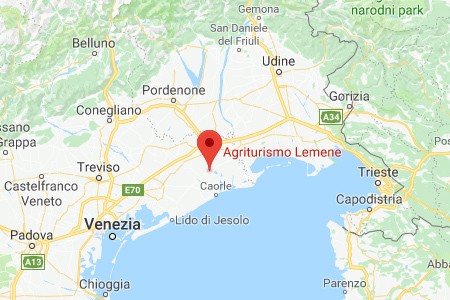 Lemene Farmhouse is located near the sea in a beautiful area of the Veneto countryside, surrounded by an agricultural landscape of wide-open spaces. Ideal for families with children or for groups of guests, Lemene has seven apartments distributed in two adjacent buildings – the Casale and the Barchessa – that once housed the farmhands. The apartments have been restored with an eye for detail and carefully chosen furniture and fittings. The apartments overlook a large garden where each family can find their own quiet and relaxing corner. Guests are free to use the beautiful 7 x 14 metre swimming pool, the seasonal produce from the vegetable garden, the ample car park and Wi-Fi. Lemene Farmhouse is in an ideal position for day-trips to Venice, Trieste, and Aquileia, and to the magnificent lagoons of Caorle, Venice and Grado. A beautiful and comfortable farmhouse that's ideal for a relaxing holiday. Great swimming pool, freshly picked fruit and very kind staff. Oasis of peace in the countryside. A marvellous place to get away from daily chaos. A really nice environment, clean and with the right price/quality ratio! We'd like to stay here forever!